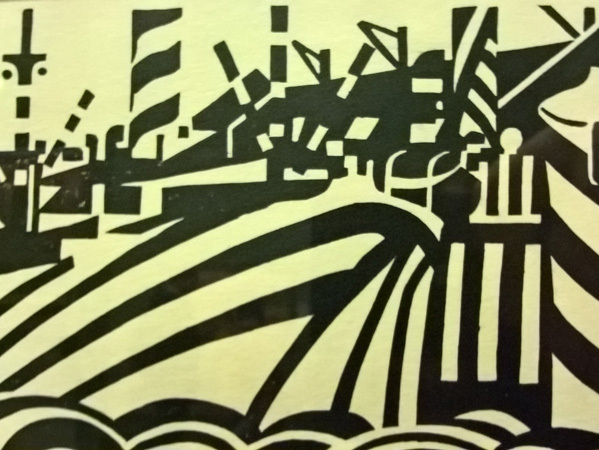 We are all aware of the docked Dazzle Ship, and Snowdrop, the Dazzle Ferry, but did you know there’s a display on board the ship docked in Canning Graving Dock? It’s hard to move anywhere at the minute without seeing Dazzle Ships. On my rounds today I came across seven displays, and I’m sure there’s probably more hidden elsewhere. One of the loveliest and most unexpected was the display of prints by Edward Wadsworth at The Walker. It’s small and sweet, and it sticks out like a sore thumb in Gallery 9, but it’s an insightful and well explained selection of prints. And as far as its made clear elsewhere, these dazzle prints were scientific experiments in camouflage. Here though, we are reminded that these ships were the idea of artist Norman Wilkinson, which were developed by the ‘Vorticist’ artist, Edward Wadsworth. Wadsworth also just so happened to be an Intelligence Officer for the Royal Naval Volunteer Reserve – two unlikely career paths to coincide. If, like me, you’re wondering what on earth a Vorticist is, I can only promise to try my best to explain. Vorticism was a swift attempt at pre-empting modernism. It’s the kind of thing that most people would turn and run from. Work that steers clear of figure and landscape entirely, and struggles to attach itself to any subject other than shape. It’s like Cubism’s angry little brother, and that’s probably why you’ve never heard of it. It’s not something that could really be related to from a public angle; rather, an inwardly reflective comment on the state of the arts at the time. All of this sounds pretty negative really, but it’s this fascination with structure and the science of shape that led Wadsworth to notice the potential of these camouflage techniques in the first place. And anything that spans between form and function in such an interdisciplinary manner is always going to stand the test of time. That’s why almost every cultural venue in the city has some sort of reference to these ships. The Walker’s display of these Wadsworth prints is a brilliant lesson to any art student who ever questions the value of the document. If, on the other hand, you’re simply interested in print techniques, these were prints at the forefront of experiment in wood block printing for their time. Putting bold and modern lines at the head of their sentiment. It’s the sort of imagery we more often associate with constructivist print work; a movement which wasn’t to happen for a few more years. So somehow, this part-time artist, and volunteer naval officer seems to have had a pretty big influence from a pretty small scope of opportunity. What is interesting, is that the more famous of the two, and the one credited with this is Norman Wilkinson, who simply had the idea for disruptive camouflage. An idea already put forward by others, but not one developed with such bold and distracting method. It was that method that is attributable to Edward Wadsworth. 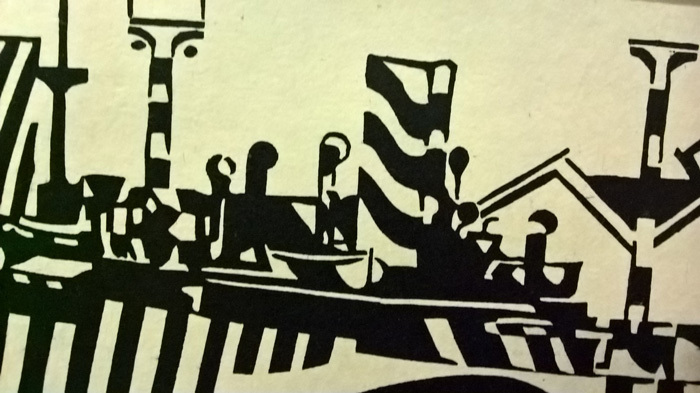 That method that led to Wilkinson being credited with Dazzle camouflage. So however you feel about Vorticism, it is an art and design movement that gave us these beautiful monuments we see today, and it is wonderful to see that reflected at The Walker.